I have had an interest for some time in putting together some Reformed and Baptistic reprints. I recently completed my first project, a newly edited and formated version of John Gill's Of Singing Psalms, As a Part of Public Worship, under the imprint of "Trumpet Books." This first effort was a bit of an experiment. The booklet is short (only 28 pages) and (unfortunately) the cost needed to be high. I hope future projects will be both more substantial (and, correspondingly, more affordable). 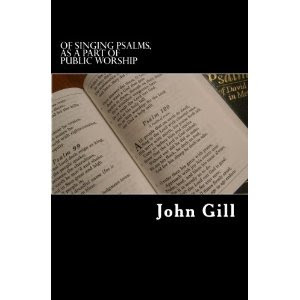 Gill's discussion of the Biblical argument for psalm singing in public worship is very valuable, and the booklet makes this material available for those who don't have access to his Body of Doctrinal and Practical Divinity. What should the church sing in its worship services? Contemporary Christian music? Traditional hymns? Today's churches have been torn apart by the so-called "worship wars." In this booklet one finds a fresh, Biblical response to the question of what is appropriate for believers to sing in worship--namely, it calls for the singing of Biblical psalms. In Ephesians 5:19 and Colossians 3:16, God commands the singing of "psalms, hymns, and spiritual songs." In many circles, there has been a return to the Biblical and Calvinistic views on the doctrines of salvation. Will there also be a hunger for Biblical and Reformed worship that includes the singing of inspired Psalms? The Gill booklet on psalm singing can be ordered (first preference) through my createspace.com site. It is also available here on amazon. Eventually I hope to have some copies on hand at an even lower price (maybe c. $5.00 per booklet). You can let me know directly if interested. I also have a second project in the works that I hope to complete soon.